Are you like an elastic band? Hayley Price brought the concept of muscles acting like elastic bands at a recent up at yoga workshop. She was describing how when muscles are stretched too strongly they will snap back like an elastic band, and tighten. I really enjoyed thinking about this concept and would like to take it a bit further. If you stretch to your very limits you will increase or maintain your range of movement, and you will also make your muscles harder. Like the the elastic band that gets pulled and pulled and pulled, and ends up looking a little deflated and wan. 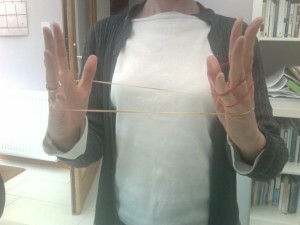 If you think of an old elastic band, how it wont snap back or ping away – but break. The muscles in young bodies are full of elastin and collagen which makes them very flexible and easily able to adapt to changes. As we age our muscles are literally less elastic, and a bit more stringy. Lovely to imagine isnt it! The muscles may be long and flexible or short and strong, but the muscle fibres become less adaptive. Im a great believer that one size does not fit all. Younger bodies are different to older bodies, muscles vary in their type whether they’re tighter or looser, and not one sort of yoga is going to suit all people. Ashtanga yoga was initially devised for army training in India, it’s great for fit strong young bodies with boundless energy. How you relate to your body and what you ask it to do is important. I have been to many yoga classes where the main aim seems to be to move a lot, to come out tired and to be ‘buzzed up’. I have been to yoga classes that seem intent on bashing the body into submission with a ‘no pain no gain’ attitude. These classes are valuable for physical fitness, but for me they’re not yoga. Yoga is about enjoying being m=in my body. I might strengthen or focus on flexibility or alignment – but for me – if it doesn’t feel good: its not yoga. I was in a class not so long ago where the teacher kept telling us what hard work wer were doing, and to keep going, keep going. This might have been excellent advice for some but it was not helpful to me on that day. Im not suggesting the moment your boy gets a bit tired you should go watch tv on the sofa, but I am suggesting that when you’re in a class and you feel like you’re not good enough, that you’re being told off, criticised, or that you cannot enjoy each moment – then that class is not right for you at that moment. This remind me of of one of my funniest yoga moments – a teacher training taster day. So its a room of people who think they want to become a yoga teacher. A yoga teacher tells us to forward bend and then goes around the room telling us we’re lying to ourselves about what we can do. This teacher traversed the room telling people off, being very judgemental about our physical poses, our mental attitude and seemed to be implying that the relationship on this course would be ‘the one who knows and the one who doesn’t’. Needless to say I didnt do that teacher training. This relates to every class I teach too, it was one of the best teachings: if you dont like something, if you’re not sure or it doesnt feel good then you must listen to yourself before me – always. …and if your elastic band mind just doesn’t enjoy something – do the best yoga in the world and ignore your teacher.